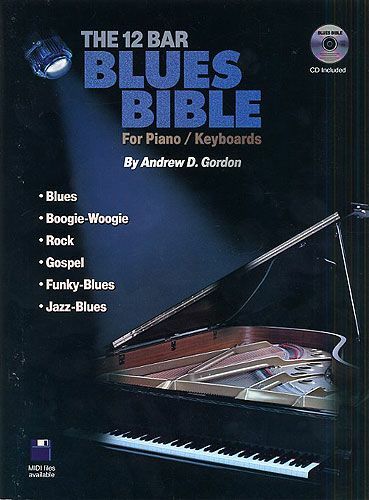 12 Bar Blues Bible by Andrew D. Gordon is a thoroughly groovy compendium of over 50 12-bar riffs that span the full range of Blues styles from ballads to Honky-Tonk, funky and jazzy Blues. 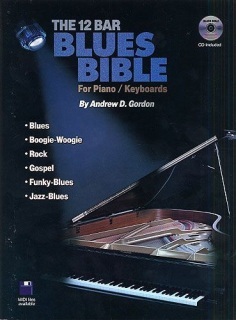 Each riff is accompanied by a demonstration CD track, with seven full 3-minute jam tracks at the end of the disc to provide lots of improvising practice options. There is a host of stylistic detail to help you capture the right grooves - before you know it you'll be jamming and improvising your very own Blues solos! I'm using the books for teaching at Southampton Solent university, I have already a hard copy of the 12 bar blue bible which i picked up in a shop here and it has been invaluable for teaching pupils riffs and improvisation techniques - they are all popular music performance students and i have found that giving them an exercise from your books in class every other week gives them a structured routine of learning as many just play by ear so having to read the music is invaluable - the guide tracks help so much aswell with the more complicated rhythmic pieces. I have found your book to be of a perfect standard and the riffs all sound great, there are so many books where the music is geared for younger children, ie microjazz etc and just doesn't cover older pupils with intermediate/advanced ability levels and so I can't be more delighted to have found your website!